Take some violet and some black clay an pass it through the maximum size of your pasta machine. Start to alternate layers of each colour whil beveling the edges with a cutter as long as you add layers Put the log on one side and cut in order to obtain a square log and reduce it. Cut this log in two and lay them in a diagonal with two other logs, one violet and one black, in order to form a bigger square log. Then make two cuts as in the picture, one horizontal the other vertical. Fill these cuts with thin layers of rose clay. 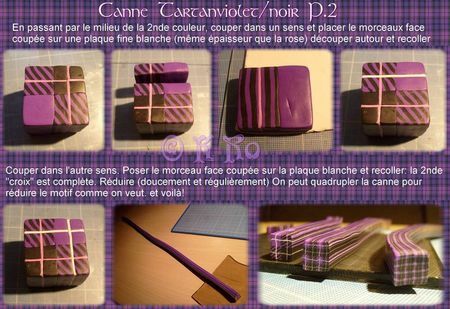 passing through the second square with one colour, make anoter cut and fill this cut with a thin layer of white colour (the same thickness of the rose above). Make a cut on the other side and do the same with some white clay: the second cross is completed as in the picture. Start to reduce this cane softly and regularly. You can multiply this cane as you desire by stacking the original cane to make a tartan design as in the picture. Voilà!! Moi aussi j'avais découvert ce magnifique tuto au hasard de mes balades sur le net. Merci pour le partage de cette superbe cane. 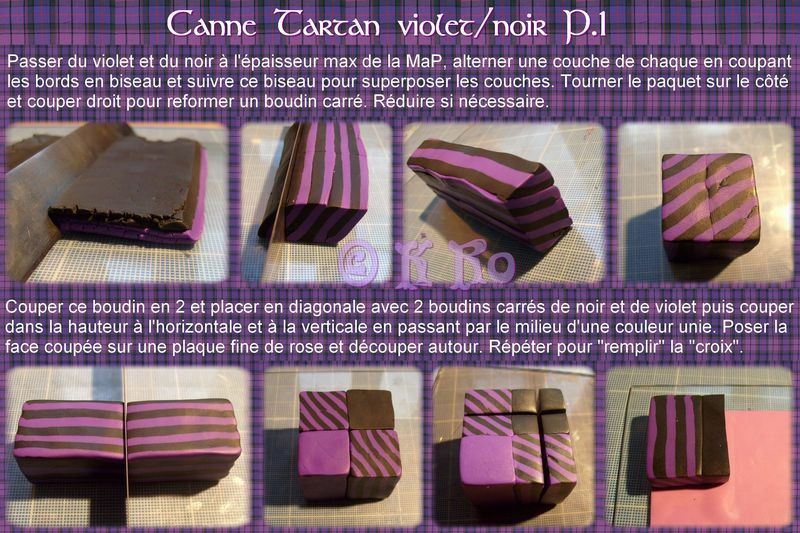 magnifique cane, ton montage est très ingénieux! C'est une bien jolie cane ! génial ma kro, tu mérites la mise à l'honneur! Très jolie cane!! Et merci pour ce beau tuto!! 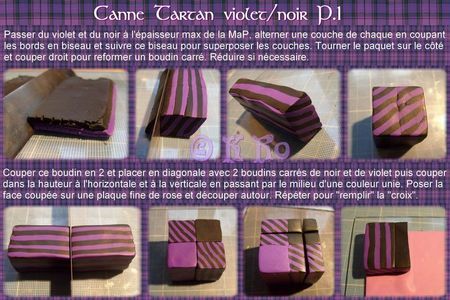 JOLI JOLI TARTAN MAIS SI JE N'AI PAS REVE CETTE FICHE N'A PAS FAIT DEJA L'OBJET D'UNE NEWS AU MOIS DE MARS ?